The Scottish Government claim the new fund could help to build on the “substantial export potential” of Scottish tidal energy. Scotland’s energy minister, Paul Wheelhouse, added: “We believe that tidal energy can not only play an important role in our own future energy system, but it has substantial export potential. “The industry has taken momentous steps forward in recent years, and we are proud to have supported that, but the path to commercialisation is taking longer, and proving more difficult, than initially expected. 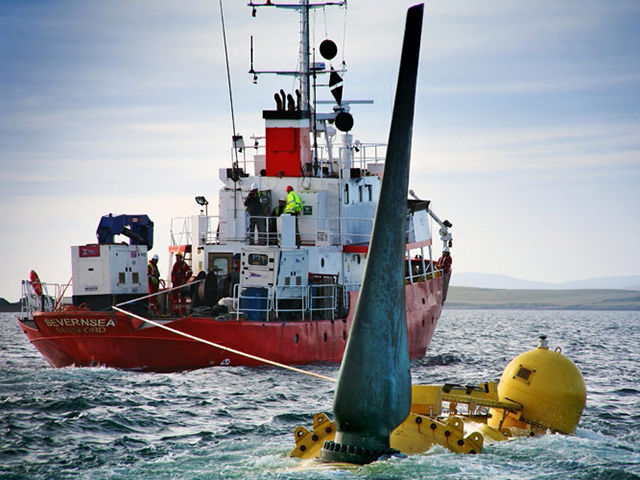 The north of Scotland boasts a clutch of world-leading tidal firms such as Orkney-based Orbital Marine Power and Nova Innovation and Simec Atlantis Energy’s Meygen project in the Pentland Firth. However, the removal of UK Government subsidy in 2016 sparked a clamour for private investment within the sector. In June, Sanjeev Gupta’s GFG Alliance took a multi-million stake in the company behind the Atlantis MeyGen tidal array. It was closely followed by Orbital Marine clinching its £7m investment target to build the world’s most powerful tidal turbine. Andrew Scott, chief executive of Orbital Marine Power, said: “This achievement has been the result of a lot of hard work and commitment over the years from both Scottish Government and the industry. Renewable energy trade body Scottish Renewables senior policy manager Hannah Smith said the new fund would drive innovation and “lower the cost” of marine energy in Scotland.